When I met up with Kelly from zazzle she said she was making me a SURPRISE! And was she right! 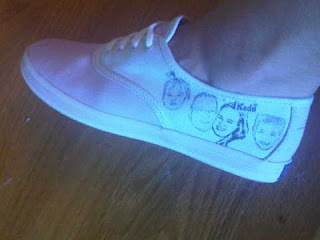 I recevied the most adorable customized tennis shoes with my family's pictures on it! I LOVE THEM so much I don't want to wear them in fear of ruining them but I want to show them off! Zazzle is the world's leading platform for quality custom products. Zazzle's proprietary technology enables individuals, professional artists, and major brands, including Disney and Hallmark, to create and offer billions of unique products for customers worldwide. Zazzle's rapidly expanding product base covers every topic imaginable and includes t-shirts, business cards, invitations, in addition to a variety of custom gifts. Upon creation, products are instantly and accurately visualized on the site and offered in the Zazzle marketplace. When ordered, each product is made on-demand, typically within 24 hours. Launched in 2005 and based in Redwood City, California, Zazzle's vision is to redefine commerce, powered by the world's imagination. From shoes, to shirts, and postage stamps, Zazzle has everything you need for a custom Back to School look! I totally want to win so I can make a pair of ferret related shoes for the shelter promo! I want this bc I'd do some special Christmas stamps! "Like" Tanya Peila on Facebook. I want to win it because it is so cute. 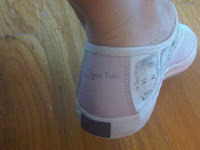 I would love to get a pair of customized shoes! I love shoes! And I love personalized things! The two together? how lucky you are! I would love to shop at Zazzle and get some fun personalized back to school things! No more Sharpies on my kids' stuff! I love Zazzle!! Would love to win to get something unique! Wow! I have been wanting some custom stamps from them. I would love to win! Like" Tanya Peila on Facebook. I would love to get something from Zazzle with my blog logo on it. THANKS! I would love to either get a cute personalized pair of shoes or a t shirt for my oldest for back to school. Thanks so much for hosting this giveaway! Becuase I want pictures on MY shoes!!! my birthday is coming and i would love to win so my husband could get me something from zazzle.i love their stuff.